In the American classic Gone with The Wind, Scarlett O’Hara briskly tied the green ribbon of her oversized Parisian bonnet as she scurried off to the big summer picnic at the Wilkes plantation, Twelve Oaks, for her chance meeting with a dashing Rhett Butler. Former first lady and international style icon Jacqueline Kennedy Onassis made the pillbox hat one of the most fashionable style trends of the ‘60s. And, most recently, singer Aretha Franklin created a flurry of media attention when she wowed the nation with a customized grey felt hat, complete with Swarovski crystals, at the Obama inauguration. The running count on the Facebook fan page for Franklin’s hat is now over 100,000. From first ladies to classic movie scenes to royal weddings, hats have been a key part of women’s fashion for hundreds of years. Now, a Main Line milliner is making a name for her stylish, custom-made hats. Jackie’s Hat Box is giving everyday social butterflies an opportunity to make a dramatic grand entrance at an upcoming cocktail party, spring fundraiser or, most importantly, the upcoming Devon Horse Show. AroundMainLine.com is the official media sponsor of the 2009 Devon Horse Show’s Ladies Day Hat Contest—which will be emceed by popular television personality and Horse Show veteran Carson Kressley. 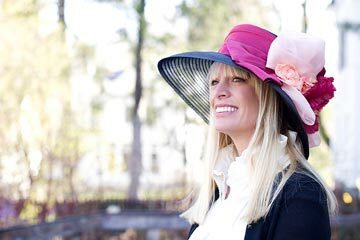 The contest is Wednesday, May 27th from 1-2 p.m.
Jen McGowan, 30, is the owner and creative genius behind Jackie’s Hat Box, which has become a thriving, Main Line custom millinery business. “The first hat I made when I was only five years old and I remember it so well! It was a Styrofoam plate with a dove on it and some millinery fruit. 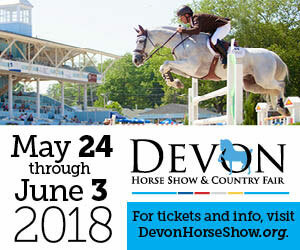 I grew up across the street from the (Devon) Horse Show and we would always go there to volunteer every May. My mom bought me my first Devon hat, which was a straw hat, and that started my love of hats,” explained McGowan. Those memories fed a creative process that has led to a booming business for this stay-at-home-mom of Jackie, almost two and for whom the business is named, and Shelby, six months. “It’s a true labor of love. I put my heart and soul into my hats and it’s something I am very proud of. As a mother of two young children, this is my sanity check to come into my workshop and escape into my creative world! This is where I get my down time and get to craft my hats for my great customers,” said McGowan. An active, enthusiastic member of Devon’s PR committee, McGowan works out of her Wayne home, with a converted garage set up as her design studio for her elegant, one-of-a-kind creations. Clients bring their outfits as a starting point for the creative process. “I like to build the hat around the outfit and the context of the event. 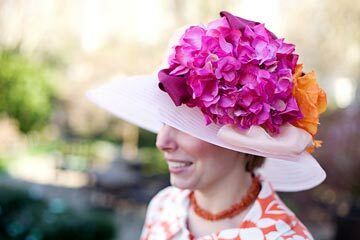 If they are going to a wedding, it is one approach—a hat for summer cocktail parties is probably less formal, more practical in its design,” explained McGowan. In her third season of designing beautiful hats for Main Line brides, social events and the region’s equestrian culture, Jackie’s Hat Box is catching on. 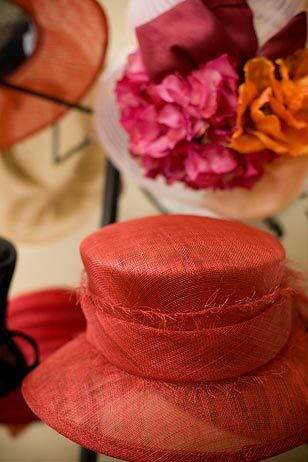 McGowan’s beautiful creations have been worn by Jane Pepper, President of the Pennsylvania Horticultural Society, board members of the Devon Horse Show and a lucky woman who custom ordered a hat for the 2008 Kentucky Derby. “I called the hat for the Derby last year ‘The Run for The Roses.’ It was a stunning oversized black hat and I incorporated gorgeous red roses around the brim. My customer bet on the trifecta and, would you believe it, walked away with $90,000! That’s what I call a lucky hat!” The customer quickly returned to get the roses replaced with sunflowers for The Preakness, but didn’t have the same string of luck. At least that’s what McGowan surmised after not hearing back from her. Natasha Bolis of Berwyn beautifully models one of McGowan’s one-of-a-kind custom hats. Bolis is a loyal client of Jackie’s Hat Box. McGowan did not take any classes to train for her millinery business. The Archbishop Carroll grad studied horticulture at Cornell and found that experience and her love of flowers (and experience in landscape design) led to a natural transition into her booming millinery business. Naturally crafty, she read hat-making books cover to cover, researched on the internet and ordered a few how-to guides. Yet, like every artist, McGowan has designs that don’t always come to fruition. “I have a pile of failure hats, sometimes things don’t always work out exactly how I envision them being constructed. It’s all part of the creative process,” she explains. McGowan begins the structure of a hat based on the planned wardrobe combined with the width of her client’s shoulders. She uses various components to structure and design her hats-including Sinamay, a very malleable, natural fiber which allows for proper construction and interesting angles. Horsehair and Milan straw are also integrated into her creations. 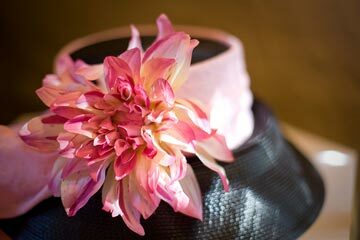 McGowan’s hats are affordably priced, starting at $125, with custom orders beginning at $200. “My motivation for keeping the cost reasonable is that I want my clients to build a hat wardrobe with me and have a hat for every occasion and every outfit, within reason. I want to develop a special relationship with each of my clients and work with them on building a fashion-forward, beautiful hat wardrobe they can be proud to sport,” said McGowan. “I would love for Jackie’s Hat Box to become the milliner that outfits the Main Line. It’s part of my vision and goal with my company,” enthused McGowan. Among the company’s current prestigious clientele is a pair of Main Line women who will be attending the 27th annual Frederick Law Olmsted Awards Luncheon in New York’s Central Park on May 6th. It is one of the country’s renowned garden parties and a must-attend for the east coast’s social elite. The famous hat luncheon has over 1,200 attendees, with approximately 80% donning their head-topping finest – which is simply required to make a sensational fashion statement. Past attendees include some of New York’s most philanthropic women including Blaine Trump, Katie Couric, Joan Rivers, B. Smith, Martha Stewart and Erin Lauder. The millinery concoctions of the partygoers span descriptors – breathtaking, innovative, grandiose, chic, quirky, and so on. 6ABC will be featuring Jackie's Hat Box on their new Saturday night show, FYI Philly this weekend, May 2nd at 7pm. The team at FYI Philly is working closely with AroundMainLine.com to bring our unique, online features to life with coordinating television segments celebrating the great people and places published by AML. The local duo attended last year and felt as if their hats didn’t measure up to those of other attendees. It is quite a coup as a young hat maker for McGowan’s hats to be making their debut at America’s most famous millinery affair. “I am so excited to have two of Jackie’s Hat Box creations at FLO, I can hardly believe it! They told me they didn’t feel like they brought their A game last year, and believe me, that party is fiercely competitive with ladies and their hats! They sent me an email through my website and said they were focused on stepping up their outfits this year and wanted to know if I could create them two hats that really make their entrance memorable. They commissioned Jackie’s Hat Box to step in to help them make a statement at this year’s event. It’s a great opportunity because everyone there wants to know where the other woman got her hat” enthused McGowan. Hat courage, or chutzpah, is most definitely key to walking into a party with a hat and a sense of confidence. McGowan emphasizes that it’s an important part of wearing a hat well. 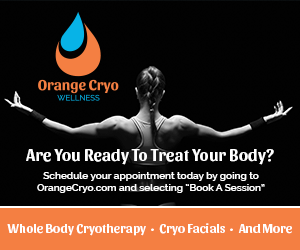 “I also advise my clients who are first time hat ladies – grab a little glass of champagne, put your shoulders back, and hold your head high. With that attitude, anyone can walk into a party with one of my hats and wow their friends and family this season. You can really ‘bring it’ when you wear a hat–be someone else when you have a hat on, try on a new identity for an afternoon. When my clientele feels comfortable with the hat they are wearing, even if they are not a hat person from the start, at that moment they are a hat person,” said McGowan. Natasha Bolis of Berwyn is one of McGowan’s most loyal customers and has dozens of her creations, proudly sporting them at Main Line events and the Devon Horse Show and Country Fair. “I always think when I come over for a consultation with Jen that I will be picking something out very plain. But, I inevitably always end up with something that’s a statement piece! Last year at (CHOP’s) Daisy Days, I had this fantastic hat that was black with a beige bow. She has such a great eye for design—her styles are fun and feminine and once you start working with her, you want to make that statement when you walk into any party or wedding. When I wear one of Jen’s hats, I feel like a lady and I know I have a special, beautiful hat,” explained Bolis. McGowan adds that Bolis’s 2008 Daisy Day hat was eventually shipped off to be worn by a European customer for an English wedding. McGowan is spearheading this year’s Ladies Day Hat Contest at Devon, sponsored by AroundMainLine.com. It’s an annual tradition at the Horse Show that the entrepreneur feels can be marketed to a whole new audience by leveraging AML, reaching an online audience that may not be aware of a great Main Line tradition. “I really want to step up the awareness and celebration of the Hat Contest. 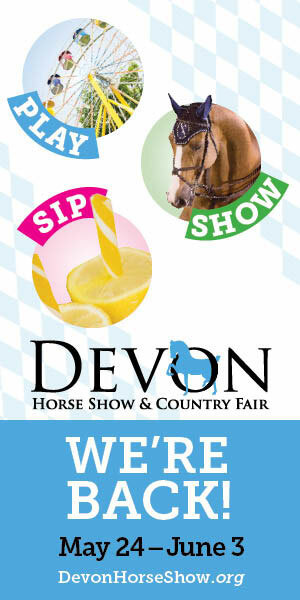 I’ve been involved with this event for almost five years, and this year it’s officially my assignment to branch out in the way we market Devon. We want to get the word out to the younger gals on the Main Line and with Carson Kressley as our emcee and AroundMainLine.com as our marketing partner, it should be a very successful event,” said McGowan. Interested in ordering a custom hat from Jackie’s Hat Box for your next party, fundraiser or wedding? 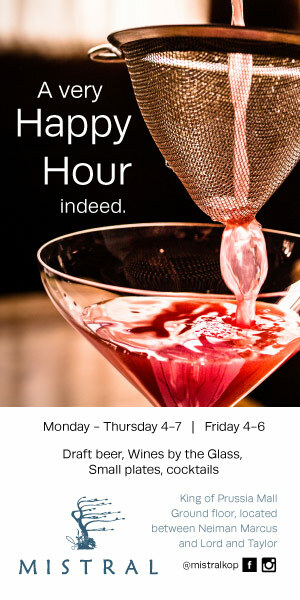 Owner and milliner Jen McGowan can be reached via email at: jenmcgowan@msn.com. For more hats and seasonal styles, visit www.jackieshatbox.com. now ready for the Derby and the Horse Show!!! Celebrating women entrepreneurs on the Main Line is so important to our culture and economy and your site seems vested in doing this-kudos. Look forward to more and I want a great hat like these beautifully pictured! Great article, beautiful photos. The hats are lovely. Jen’s hats are gorgeous and exquisitely made. Her taste and attention to detail are what make her stand out! !